This hidden treasure, set deep in the beautiful countryside of south Oxfordshire, offers a relaxing break in nature & the opportunity to revitalise & enjoy reconnecting with self & others, all less than two hours from London. 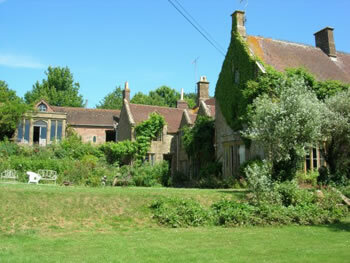 Bonhays Eco Retreat is nestled in the hills of West Dorset. Secluded & peaceful, it is surrounded by beautiful countryside, with it's own heated pool & 2 miles from the coast for a lovely walk & sea swim ! A feast for the senses as you take in the intoxicating smell of the pine and eucalyptus trees and the crystal clear, deep blue of the Ionian sea. There will be two yoga classes a day & the opportunity to book massage treatments (nb extra cost). Mornings will begin with meditation and pranayama (breathing techniques) & asana class. In the evening we will have a shorter meditation and restorative asana class & yoga nidra. There will be two yoga classes a day, a workshop and the opportunity to book massage treatments (nb extra cost). Mornings will begin with meditation and pranayama (breathing techniques) & asana class. In the evening we will have a shorter meditation and restorative asana class & yoga nidra. Delicious vegetarian food will be served and plenty of time just to hang out and chat, meet new people, read, relax around a log fire and enjoy being in community in natural surroundings. Arrival time on 30th from 2pm onwards & we'll have our first yoga session together at 4pm. On the 2nd we'll finish at 3pm. Hazelwood is the perfect place for yoga. 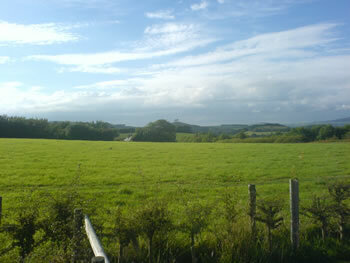 Sitting in a valley, surrounded by acres of unspoilt nature, this idyllic spot, shared with a choir of birds, deer and foxes is a haven for the spiritual seeker and nature lover .An ancient oak tree guards the entrance of the house and the flowers in the summer are both stunning in colour and intoxicating in fragrance. As the night draws in to reveal its starry sky, the silence is broken only by the sound of its river and the call of the nights creatures. It is a place to unwind and return to that quiet place within. Space to think, space to breathe, space to be - is what Hazelwood quite naturally has to offer. 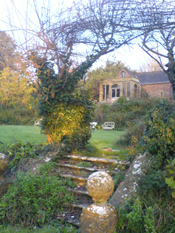 As spring blossoms into early summer & nature dons once more its fresh green mantle, there’s no better time to head down to the Dorset coast & the lovely Symondsbury Manor for a truly relaxing weekend of Hatha Yoga, delicious, healthy food & good company. 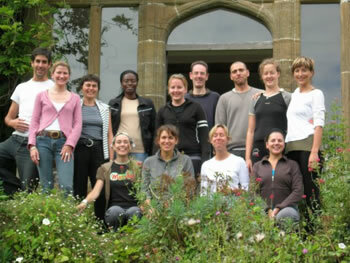 This will be our 7th retreat at the Manor & back to the original team! 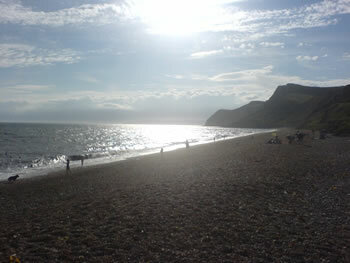 So time to enjoy & relax with plenty of yoga, massages, workshops, walks through buddding hedgerows, fresh ferns to beachside, - or, if chilling out on the lawns with a good book or just the gentle May sunshine caressing your face sounds good? mmmm – it’s your choice ! Click to download PROGRAMME & MORE INFO & BOOKING FORM - why not print out and read through quietly with a cuppa? 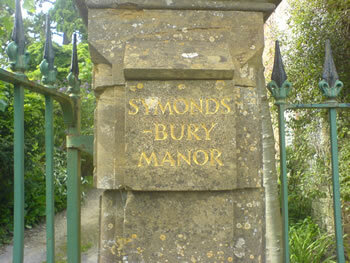 SETTING: (see photo galleries on rhs) In the very pretty village of Symondsbury & 1 ½ miles from the beach, Symondsbury Manor is a lovely Tudor Manor set into fantastic gardens, the perfect place for a chilled weekend of yoga, healthy food amongst good company. 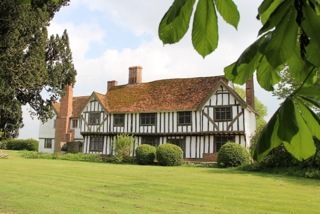 Owned by a painter, the manor is filled with artwork, a beautiful oak panelled/ floored hall for yoga, a big cozy agga country kitchen, large converted barn sitting and dining room, filled with comfy sofas, wood burning stove and view over the grounds - all this only 2 ½ to 3 hrs from London ! ACCOMMODATION : comprises of single occupancy (mostly double-bedded rooms including 2 Four posters!) and twin bedrooms. FOOD: ... has always been a high point of retreats at the manor... colourful, inventive vegetarian dishes based around fresh organic and farm house produce – not only a great treat to our temple bodies but delighting our senses too ! Arrivals from 12noon & ends 4pm Sun . The £75 deposit is non-refundable. 7-14 days before arrival - 50% of subsequent cost. Less than 7 days before arrival - 100% of total cost.